Challenge: To build a bait station that allows the recording of nocturnal animals at our School that is able to resist being tipped over by a hedgehog. Background: As detailed in the three previous posts the students have been creating 'bait stations' at allow nocturnal animals at school being photographed by a trail camera. The students have identified that Hedgehogs (which are considered a pest here in New Zealand) are a significant factor at our school. We have recorded evidence of the hedgehogs tiping over our bait stations by standing up and pushing them over, allowing them to access the bait. In the last two revisions of the print the student was targetting the legs of the print, as larger legs are intended to provide stability to prevent the hedgehog from being able to tip the bait station over. Level of Difficulty: Low - this version of the print has replaced a 'spike' version of the legs with a cyclinder shape. Despite numerous attempts at printing those they had not proven successful (see previous prints0 so the student opted for this design with the intent to bury them in the ground. Timeframe; Ten hours - the modification with the legs did not significantly alter the print time for this project. Size: The intention with the 'spike' version of this project has not added to the size of the legs, the design of them has shifted to a cylinder shape as can be clearly seen in the photographs. 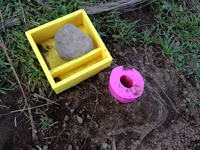 What we would do differently: This variation of the print solved the issue as by burying the bait station in the ground it was possible to ensure that the Hedgehog was not able to tip the station and remove the bait. 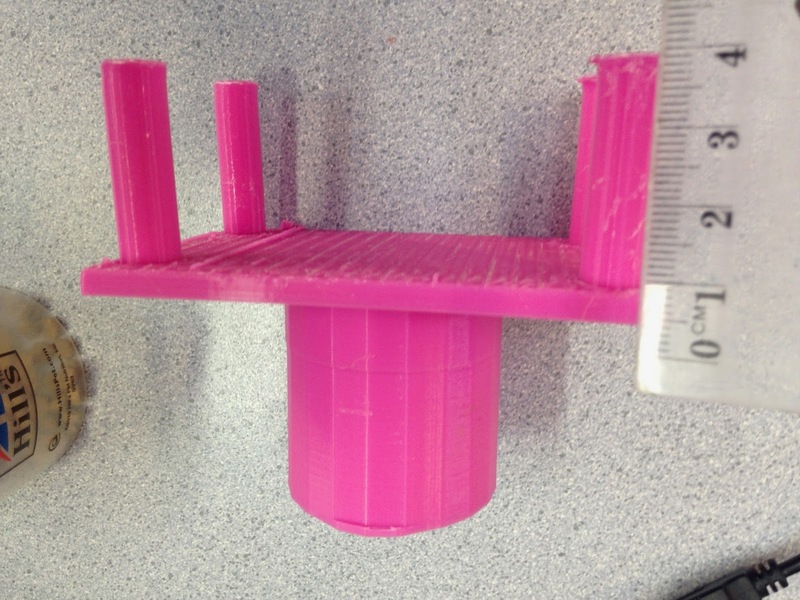 This was a positive creative use for the 3D Printers to resolve an issue.